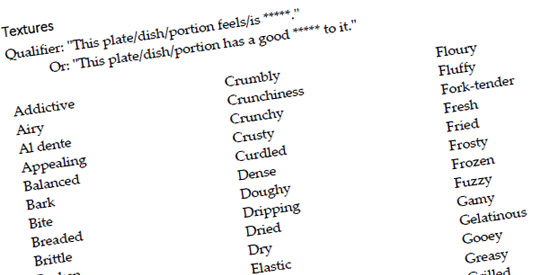 Click here to download the complete list of adjectives on our sister site, Cuisinology.com. We eat regularly. Whether you’re a snacker who barely eats anything but small meals throughout the day, or a trucker or charter bus driver who eats big meals to endure the longer drives, or an athlete or a member of the military who eats larger and more specific meals to achieve various physical goals, food is a part of our everyday lives. We then go to eat at a restaurant, take a bite of food … and the server invariably appears just then to ask “How is everything?” After chewing that bite of food and finally swallowing, do you honestly know how discuss what you’re eating? If you’ve watched the countless competitions on various food channels you might have an inkling of what to say. But like anything else, it takes practice. Consider the popular Chicken Pot Pie. There are variations that some might also mention, such as the salmon, lobster, and pork pies popular in New England, the Cornish pasty of Minnesota and the upper peninsula of Michigan, and other local specialty pies. Going with the basic version, a Chicken Pot Pie, be it from a Southern cook, a pie shop in Maine, or a Grandmother in the midwest, has some characteristics which you may expect but haven’t actively thought through. The crust can be a light and flaky butter crust such as the ones found in fruit dessert pies. The more common crust is a shortening crust, although lard is once again becoming popular. These crusts are more robust and dense than their flaky, buttery counterpart. In either case the baker needs to protect the edge of the crust to prevent excessive browning or singing during cooking as this makes the crust edge unpalatable. The sauce in the pie should be rich and thick, creamy and well-seasoned, with a robust chicken flavor. It shouldn’t be thin or watery, or be floury or starchy in flavor or texture. The vegetables should be firm and have a good bite to them, being well-seasoned and flavorful, certainly not soggy or bland. There should be ample chicken that’s well-seasoned, moist, fork-tender, and has a good bite to it, not soggy, bland or fatty whatsoever. Overall the pie should look appealing, have ample filling to be the robust comfort food the diner expects it to be. 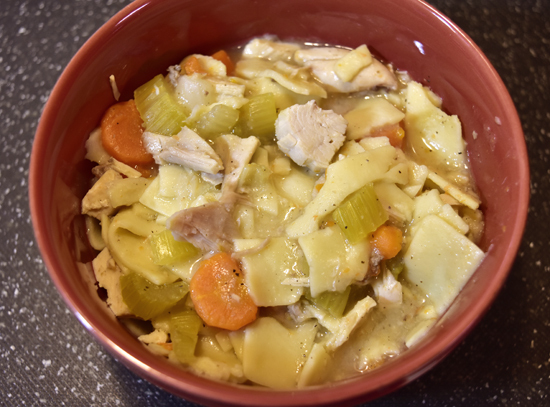 What diners expect to find in a good Chicken Pot Pie is now condensed into this relatively short list of adjectives, including both pros and cons. This becomes a method for determining if your own pies are acceptable, or if those made by others or served at restaurants you visit are acceptable. What’s right or wrong with a given pie can then be discussed and any adjustments can be made. The list can also be used to develop cards for judging Chicken Pot Pies at competitions. Learning to talk about food can be that versatile. Simple: Ensure any diner can understand the menu description without much further explanation by the server. Accurate: Preparation methods, personnel quality certifications, and other descriptors have to match how the dish is made. Truthful: Point-of-origin or source, ingredient certifications, and related information cannot cause a “bait and switch” situation. This can be baked and served from whole, frozen pies without possible issues. The pie crusts, chicken and vegetables might be from frozen and the sauce might be from a can, as that’s how Grandma might have made it. But the pie has to be assembled and baked in the restaurant’s kitchen or in a supplying commissary. Only the vegetables have to be fresh, the rest can be as in the first example, including the chicken being from frozen. All of this has to be absolutely true for each and every pie. If, for example, local chicken isn’t available for some pies, or anything else in the description cannot be fulfilled, it’s better to 86 the pie off the menu until the described ingredient is once-again available than it is to possibly become embroiled in claims or court judgements of false advertising. One of the most popular recipes on Luna Pier Cook is Mary Jewett’s Kentucky Sweet Corn Pudding. We’ve enjoyed it ourselves for many holiday get-togethers over the couple decades since we first got a copy of it from Mary herself. The number of page views on the recipe have really skyrocketed since I first posted it in 2008 as people search for an alternative to the standard Green Bean Casserole. It’s becoming a staple all its own. For Christmas dinner in 2018 our daughter Bree told us she’d located a recipe she really liked along the same lines. 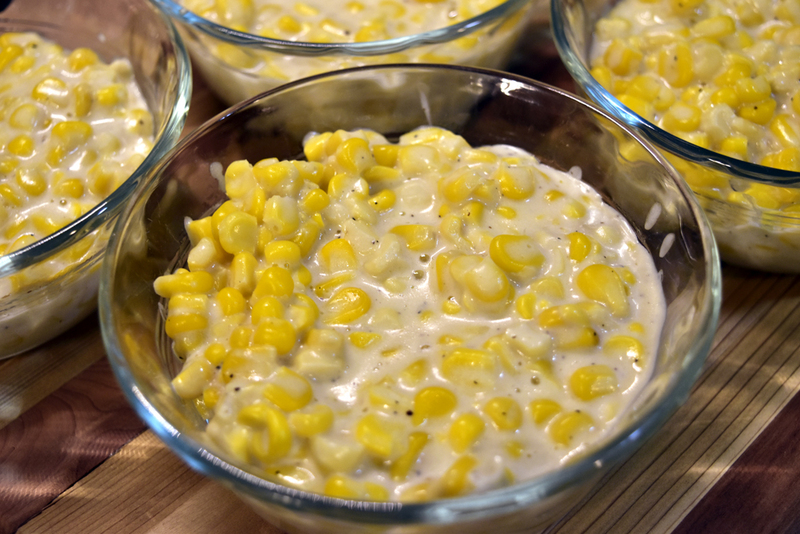 It was apparently just as simple to make, using a crock pot to develop a creamed corn that would be just as good as our now-standard corn pudding. I was a bit leary of it myself, as I could just stand there with a spoon needing to be dragged away from Mary Jewett’s specialty. But Bree insisted, and on the day of our family dinner she brought a crock pot with a batch of the stuff in it. I found I could just stand there with a spoon needing to be dragged away from this new specialty. Rich and flavorful, with crisp corn kernels and a thick cream, and just the right amount of salt and pepper … It was really nice stuff. It turned out the recipe was Crock Pot Cream Corn by Holly & Katie over at The Semisweet Sisters. Its quite simple as Bree had said, but is also hearty and filling … Still, I could just stand there with a spoon and keep eating it. We now have two corn dishes for the holidays. Choose your weapon. Put all the ingredients into a crockpot. Cook on high for 2 to 4 hours or on low 4-6, stirring after the first hour. Stir and taste, and adjust salt and pepper as desired before serving. For more freshness, you can also cut kernels from fresh cobs of corn and freeze them for 24 hours prior to using them to make this dish. Just be sure to still have the same amount of corn by weight. How many times have you gone to the deli to get meat or cheese sliced, they ask how thick you want it, and it still takes three or four tries to get it right? Or if you own or work in a deli, how frustrating can it be to be on the other side of the same conversation? There have been many times I’ve actually given up and taken whatever thickness they’ve cut, regardless of whether or not it’s suitable for the purpose, and had to make do. This may not seem like an issue to many people, but there are differences in how meats and cheeses should be sliced for a given dish. Roast beef is a relatively thin slice for sandwiches, but raw ribeye for Steak & Onion or Philly Cheesesteak should first be frozen and then sliced as thinly as possible. Bologna for Fried Bologna Sandwiches should be around 1/4″ thick, but for cold sandwiches the meat isn’t more than half that thickness. Similarly, cheese for sndwiches might be 1/8″ thick, but to roll up cheddar for an appetizer it’ll need to be 1/16″ or less. To assist in this area, here’s a handy-dandy Deli Slicer Size Chart I’ve put together for you, dear reader, to download (the link is under the viewer window), print, fold, and laminate, either to show those deli folks what you want, or for the deli folks to use to ask customers exactly what they want. The rectangles are the indicated thickness in inches, so when printing this card don’t resize or scale it. And another thing: The metric measurements are slightly off by about 1.5%, but variations will also occur due to product temperature, ambient temperature and humidity, and blade sharpness. Due to this, all settings are only suggestions. Really, there are so many variables, this whole subject can get a little nuts. The characters I’ve added to create this release of the Erudus Extended Allergy Icon Font. The above is not an image, but is the font characters themselves. For the past few years I’ve been interested in developing a set of icons for the display of allergen information on restaurant menus. The ideal set of icons would work well on both printed and online menus, and be clear enough to allow for resizing when necessary. At first I’d come up with a few versions of my own artwork, most of which were rather cartoonish. There were at least three different versions over more than a year. At one point I started working on a side project. It had occured to me the icons I was developing might work well inside their own plugin for the WordPress platform. After I got the first prototype to work, I found out that Erudus: The Food Industry’s Collaborative Solution to Sharing Product Data in West Yorkshire, UK, had released their own open-source set, the Erudus Food Allergy Icon Font. As it turned out, the EU had begun requiring the listing of fourteen allergen icons on all restaurant menus, including online and food truck menus. The Erudus Allergy Icon Font provided these icons, along with four icons for specific diet types, to the company’s (at the time of this writing) more than 85,000 caterers. The icons are also in-use within Erudus’ own database for ingredient research and recipe development, which their clients have access to. The original Erudus Allergy Icon Font, illustrating the keyed color scheme. Again, this is not an image, these are the working font characters. The display of the key legends and other presentation methods were dependent on an online styling method called Bootstrap. When attempting to use the font and its styling in a WordPress plugin, Bootstrap interferred with WordPress display methods. As a restaurant manager in the US I was aware of other allergens and diet/cuisine types which might need attention, either by current restaurant managers, or at some point in the future. Using the font made for an interesting method for creating and implementing characters to illustrate the spiciness of a dish within a menu. Because of changes and requirements within WordPress the development of the restaurant menu plugin is currently stalled. However, I continued development of the Erudus Extended Allergy Icon Font, making sure from the beginning that it had no outside dependencies. Along the way I discovered a few things, including the fifteenth included icon for Gluten (“Cereals Containing Gluten” is the designation in the EU regulations and was presented in its own icon), Nuts should be “Tree Nuts” to differentiate them from Peanuts on a quick glance from a patron, and “the Big Eight” as designated by the USDA could also be documented within the Usage notes. I hope people find this work useful. Please use the Contact Page on this site to report any issues or if you have any questions or suggestions.